© Lloyd Alexander estate, illustration © Steve Johnson & Lou Fancher. Lloyd Alexander had a long and prolific career as a writer of fantasy novels for children that could also be enjoyed by adults. He made his name with the Prydain Chronicles published from 1964-68, the first books of his I read, which were based largely on Welsh mythology. Alexander’s many other fantasy books and series explored other areas of history, myth and legend, and this one is based on Greek tales. 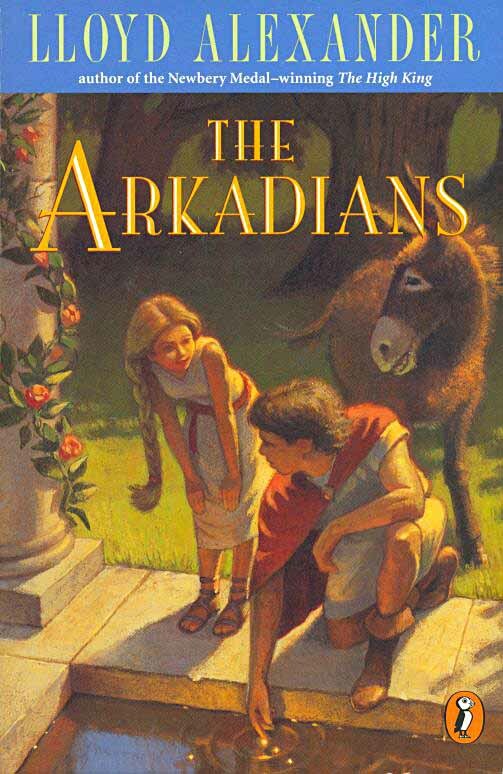 While none of the main characters will jump out as familiar names to those who know Greek mythology, the story weaves many myths and tales together, and the setting is clearly an idyllic (though often dangerous) Greek landscape, beginning in a coastal city, but carrying the hero Lucian, a talking poet-turned-donkey Fronto, and a spunky teenage girl, Joy-in-the-Dance, through a varied countryside, over mountains and across the sea to islands of adventure. The characters will be somewhat familiar to Alexander readers: the humble brave boy, the sarcastic and charming girl, the boastful and cowardly poet all have counterparts in other books of his, but rather than seeming repetitious, the skillful prose invites readers in to revisit these familiar archetypes and enjoy their latest trials, tribulations and escapades, of which there are plenty. I have to say the Prydain Chronicles are still my favorite Alexander books. He seemed to put the deepest meaning in those, his first major series, but this and all his books are fun to read and very entertaining. There are lots of plot twists, action, and a good dose of magic, making this a fun ride. Highly recommended. This entry was posted in Books, Reviews on June 19, 2010 by Todd. Have you read the Westmark trilogy? The Prydain novels are my favorite Lloyd Alexander as well, but after a fairly-standard-feeling first volume, the Westmarks take a turn into something with a lot of depth, nuance and maturity. THE KESTREL, in particular, is terrific. I read the first, “Westmark,” some years ago and don’t remember it well. I’ll give the rest a try, thanks!